Officials said that recently arrived children would not benefit from the immigration bill passed by the Senate last year or from Deferred Action for Childhood Arrivals, a program that lets minors who meet certain criteria avoid deportation. 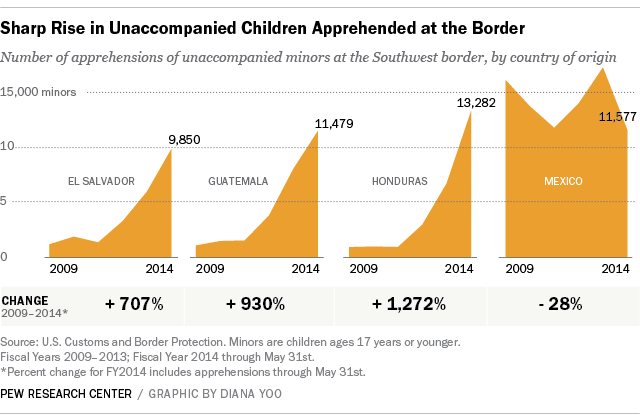 But even as the government moves to confront the situation, children, parents, immigration officials, lawyers and activists interviewed say that there has been a subtle shift in the way the United States treats minors. Experts say it is the dual dynamics of crime at home and perceived leniency across the border that have inspired many in Central America to risk the trip. The United Nations has consistently listed Honduras, for example, as the country with the highest murder rate in the world. Its latest report said Honduras had 90.4 killings per 100,000 residents, nearly three times the rate a decade ago. In El Salvador, that number is 41. The crisis has led the US to open shelters to hold all the children it has detained in southwestern border states, including centers on military bases. El Salvador's Foreign Minister Hugo Martinez announced that the government was checking on the conditions under which some 337 unaccompanied Salvadoran minors are being held in Arizona. The Foreign Minister was joined by US Ambassador to El Salvador Mari Carmen Aponte in pleading with parents not to send their children on the perilous journey through Mexico to the US border. Relatives living in the United States are searched for and contacted and the immigrant is given a court date. But very few actually show up and the children often become one of the millions of undocumented immigrants. (CNN). These are good steps to deal with the flow of child migrants. These steps, however, do not deal with the root causes of migration which are found in the lack of economic opportunity and hope in the northern triangle of Central America, and the gang violence which impacts the lives of so many young people in marginalized communities throughout the region.